Employee Income of Marketing, Design, & Online Publishing Industry Cluster | Propel L.A. 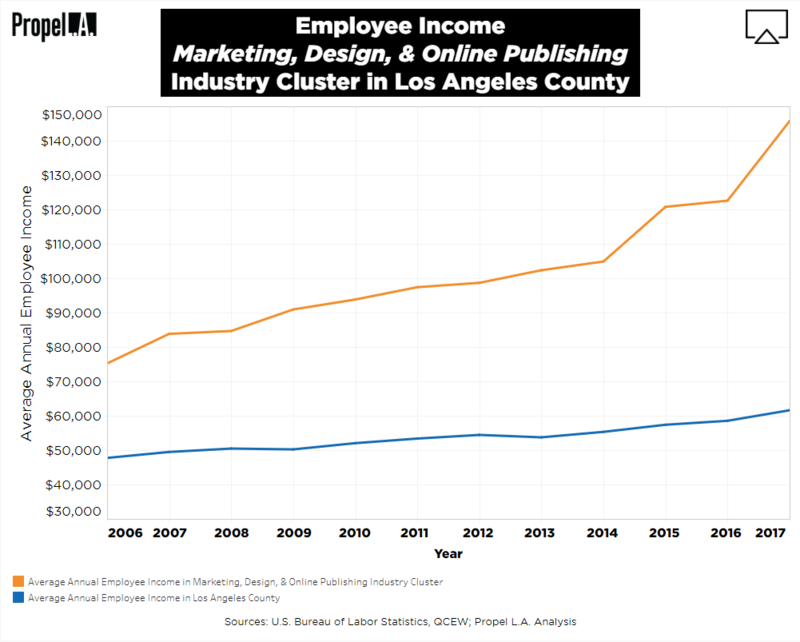 In Los Angeles County, the average income for a worker in the Marketing, Design, and Online Publishing industry cluster (“MDOP”) has skyrocketed in just ten years from $83,822 in 2007 to $145,704 in 2017. Notably, the 2017 value of $145,704 is over twice as much as what the average worker earns in any occupation in 2017 ($61,598) and more than four times the 2017 living wage ($28,163) needed for a single individual to cover their basic needs in Los Angeles County. What is the Marketing, Design, and Online Publishing industry cluster? The MDOP industry cluster is a key traded industry cluster in Los Angeles County. Some sample industries within the cluster are Software Publishers (NAICS 5112), Data Processing, Hosting, and Related Services (NAICS 5182), Other Information Services (NAICS 5191), Computer Systems Design and Related Services (NAICS 5415), and Marketing Consulting Services (NAICS 541613) (Institute for Strategy and Competitiveness, Temple University and Harvard Business School, June 2014; Institute for Applied Economics, LAEDC, December 2016). The industry cluster is responsible for creating advertising, online content, and software in Los Angeles County. Average annual income was calculated in nominal wage by taking the weighted average of all private wages in the selected NAICS industries. NAICS industries were selected by using the industry cluster’s definition produced by the Institute for Applied Economics at the LAEDC and the Cluster Mapping Project (CMP) of the Harvard Business School. Note that results may be slightly biased due to the included Digital Media industries being nonexhaustive. Annual living wage is determined by the MIT Living Wage Calculator under the assumption that an individual works full-time at 2,080 hours a year.